Mobilink has announced the launch of its first Windows Phone in Pakistan. 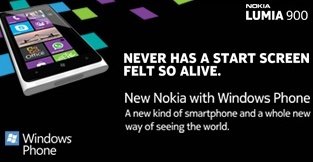 Mobilink now brings Nokia Lumia 900 Windows Phone. Nokia Lumia 900 has an engaging interface and intuitive design and is meant to enrich its users tapping experience. The AMOLED screen of Lumia 900 looks great, the incredibly deep black levels further boost the colors. Now Mobilink Lumia customers can discover Live Tiles for instant updates on their screen, Internet Explorer 9 for super-fast browsing, and beautifully sleek award-winning designs will enhance their style. Nokia Lumia 900 has a 8-megapixel camera and a front-facing camera for video calls. Mobilink now offers a free portable charger with every Lumia 900 device to keep its customers connected on the go. Mobilink also offers free GPRS for 3 months with the purchase of Nokia Lumia from Mobilink. The Nokia Lumia 900 is exclusively available at Mobilink Customer Care Centers for the first 30 days of launch. First 500 customers who buy the Lumia 900 from Mobilink will receive a Nokia portable charger free with their purchase of the handset. Click to visit Mobilink Official Page for Details abd Specs. All postpaid and prepaid customers buy the device in the first 30 days of launch will receive 3 months free internet from Mobilink.